Our research is focused mainly on gut inflammation and infection. Everyone probably knows someone with an inflammatory bowel disease (IBD) such as Crohn's disease, ulcerative colitis, coeliac disease, or some kind of food allergy. Despite years of research, we still don't know why some people get sicker than others- even in identical twins, IBD rarely affects both twins! ​Inflammatory Bowel Diseases (IBDs) are not a simple story. 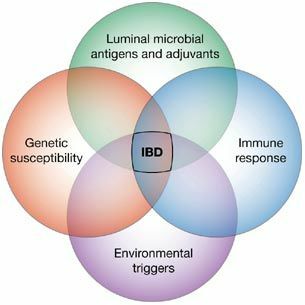 IBDs are thought to be caused by an interplay between host genes, gut bacteria, other environmental factors (smoking, stress, diet) in the context of immunity (possibly during infections). But it is clear that the immune response is critical to the development and maintenance of IBD. First, drugs that suppress the immune system (immunosuppressives like steroids) are traditionally the first thing to try and have been pretty effective. Also, the next generation of drugs (called biologicals, and have stupid names like Infliximab, Etanercept and Remicade) block inflammatory proteins made by immune cells. And finally, some heavy duty large-scale genomics (where they sequence all the genes in the cell from over 100,000 people) found that the mutations in IBD patients were overwhelmingly in genes associated with immune cell populations. So it is not a huge stretch for us to be interested in immune cells in IBD. We are focusing on a specific subset of immune cells called CD4 T helper (Th) cells. T cells are white blood cells that are critical for immunity to infections and killing of tumours, but when they act incorrectly can cause many forms of disease including IBD. So we really want to understand how CD4 Th cells are turned on and how they are turned off. This is a video from The Khan Academy that introduces some of the concepts about CD4 Th cells. So one of the coolest things about CD4 Th cells is that have the potential to develop into many types of cells that have different functions. ​Of course the names are dumb- Th1, Th2, Th17 and regulatory T (Treg) cells. But although these cell types start from the same cell, they are very different in the type of inflammation they cause and the types of infections they control. For IBD, we focus on Th1, Th17 and Treg cells. We will leave out Th2 cells for now (they are very important to control worm infections and are the cause of allergies and asthma).